The medical category provides a list of WordPress themes that can be used to build websites in the medical field. 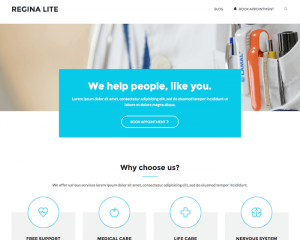 For instance, if you are a doctor or a physician who wants to promote your service to your audience, you can use one of these themes to create a professional website about your medical services. These themes can also be used by medical institutions that offer a wide range of medical services for their patients. As long as it has anything to do with medical professionals, you can use these themes for your website. These themes will allow you to add various sections on your home page, such as client testimonials, features, medical team, and so on.